This modern hotel is located just a few minutes walk from Benidorm's sandy beach and near the shops, bars and restaurants of the city centre. Enjoy live shows, buffet meals and a great pool. These Benidorm apartments are situated in the tourist area of the RincÃƒÂ³n de Loix, only a few metres from the Playa de Levante. This hotel is located just 300 metres from Levante Beach in Benidorm. It has indoor and outdoor swimming pools, a spa and gym. The Ambassador Playa Hotel offers excellent facilities in a great location. 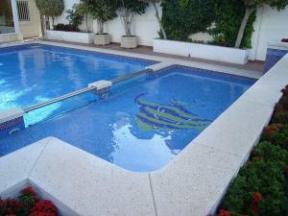 This apartment complex has a large swimming pool and is only 50 metres from BenidormÃ¢â‚¬â„¢s Poniente beach. There is also a fitness centre and sauna. This outstanding, original Benidorm hotel is made up of traditional Spanish buildings arranged as a village, complete with its own village square, 2 golf courses, 5 outdoor pools and artificial beach. One of Benidorm resortÃ¢â‚¬â„¢s most recognisable buildings, this 186 metre-high hotel offers amazing views of the Mediterranean Sea from the La Cala area of Benidorm. Set in a tranquil location in Benidorm, Apartamentos Evamar Apartments overlook LAiguera Park, and are just a 10-minute walk from stunning Levante beach and Benidorms old town. This benidorm holiday hotel is located in the city centre, 200 metres from Levante Beach and a further 100 metres from Poniente Beach. Centrally located, in the Old Town area and hardly 300 metres from the popular Levante Beach and lively promenade, the Hotel Benidorm Plaza will appeal to those seeking a comfortable base, right in..
Apartamentos La Caseta Apartments enjoy a great location ext to La AigÃƒÂ¼era Park, just 5 minutes from BenidormÃ¢â‚¬â„¢s old city centre and 10 minutes from the resortÃ¢â‚¬â„¢s famous beaches. Benefitting from a setting just 400 metres from Levante beach and BenidormÃ¢â‚¬â„¢s old town, this contemporary-styled hotel offers a range of facilities to help you enjoy the sunshine. This functional hotel, situated in a residential area in the Sierra Helada, just 600 metres from Playa de Levante beach, has a spa and indoor and outdoor swimming pools. Look out over the Costa BlancaÃ¢â‚¬â„¢s Levante Beach and the Mediterranean Sea from this fantastic, beachfront hotel. Relax on the beach in summer or enjoy a dip in its heated pool in winter. Set in the Sierra de Cortina Mountains, with views of the Costa Blanca, this Asian designer hotel is next to 2 golf courses and theme parks in Benidorm. Situated in an unbeatable area in Benidorm, these apartments are 100 metres from Levante beach and 10 minutes from the centre and the old town.